At the end of this week, I’ll be skiing down the slopes of Alta Ski Area in Little Cottonwood Canyon, east of Salt Lake City. That’s at least my goal. I like mountains, I like snow and I generally like skiing. In high school, I changed directions and started snowboarding. I was never super comfortable snowboarding, but skiing in Ohio wasn’t challenging at all, so I changed things up for some entertainment. 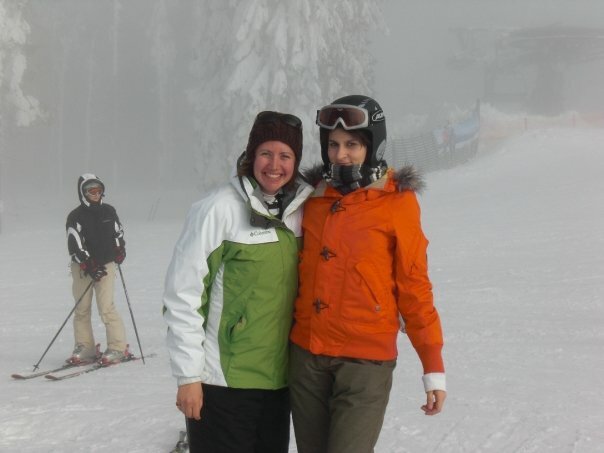 One of my Austrian friends invited me to join her snowboarding in February 2009 at Hochficht in the Bohemian Forest where Austria, Germany and the Czech Republic meet. I jumped at the chance and had a good, but exhausting time. You can pretty much touch the Czech Republic from the top of one of the hills at this family-friendly ski area that wasn’t too scary for my lack of experience in the ski and snowboarding world of classy resorts. Then I moved up to the big leagues. 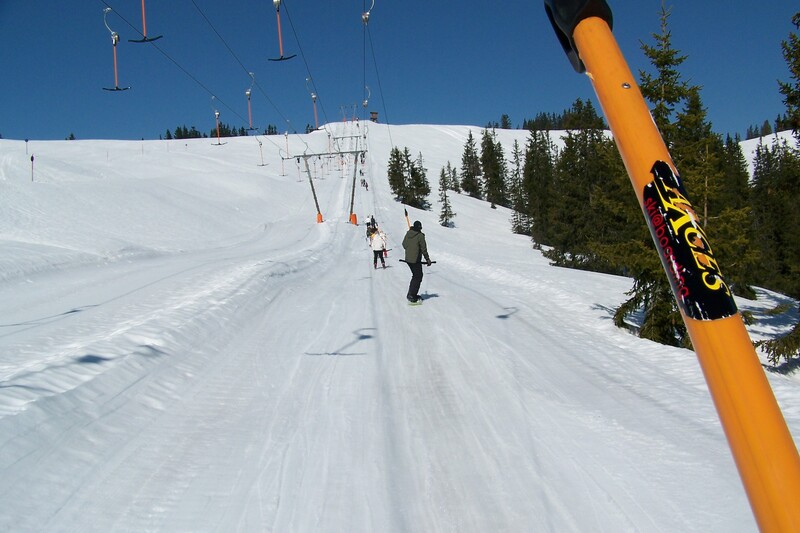 In exchange for some English proofreading, I was given a ski adventure in the Alps. 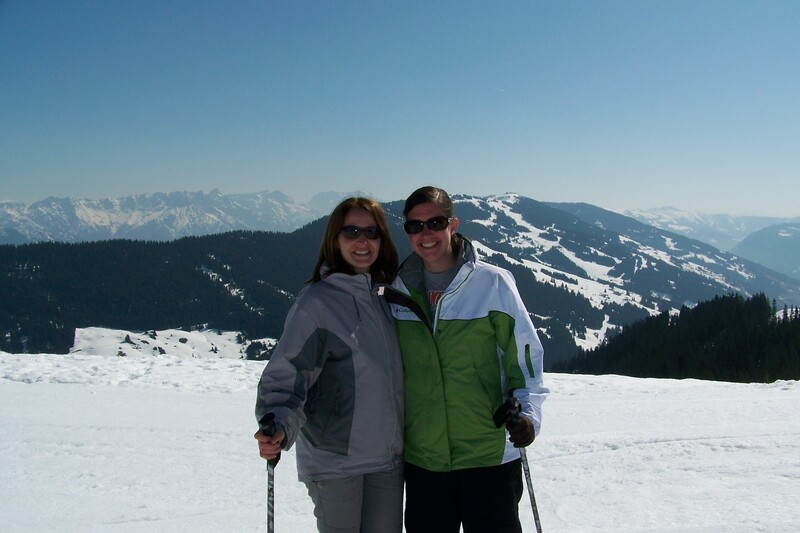 My friend Heidi pretty much grew up on the Alps in the tiny town of Leogang. Her house is on the side of the mountain and you could ski to her house from the resort area Skicircus (here’s the map), with slopes in Saalbach, Hinterglemm and Leogang. I was pretty excited about this adventure, because it was one I dreamed of completing while studying abroad in Austria. 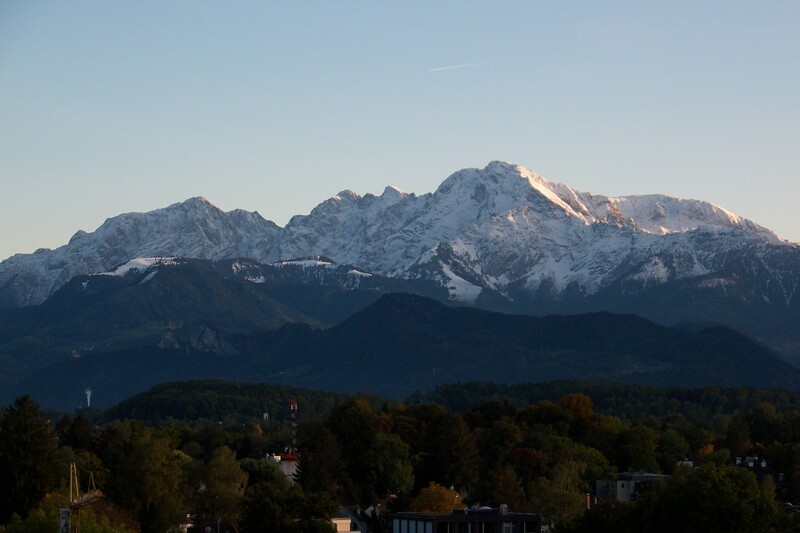 I had become accustomed to the thought of high peaks, from climbing the Untersberg in Salzburg to admiring the Alps on my walk back from school to my dorm, and any train ride south took you to the mountains in a matter of minutes. And these were real mountains. 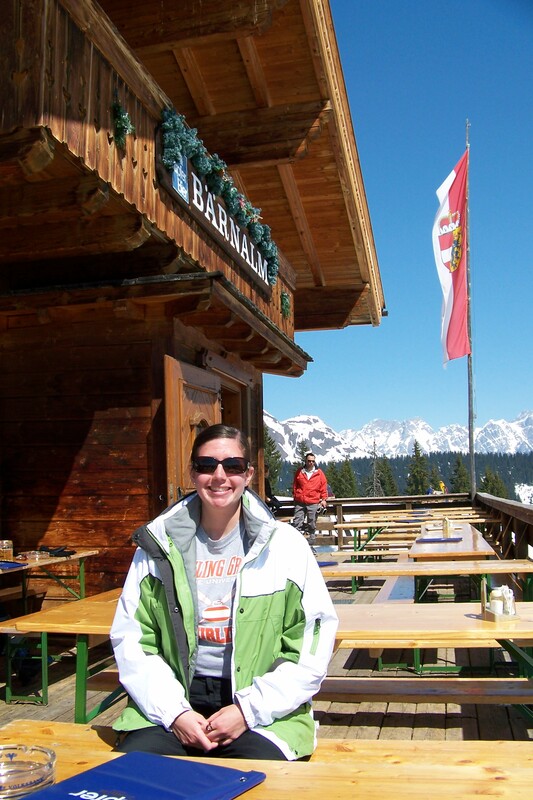 To a girl from Ohio, Holiday Valley Ski Resort in New York is mountainous, but in Austria there are jagged, snow-capped, granite peaks just waiting for me. Until I got to the lift and pretty much freaked out. When I snowboarded earlier in the year I experienced the t-bar lift and ski passes you keep in your pocket and wave at a gate to get to the lift. This time around, I began my ascent up the mountain on a gondola, standing inside with my skis hanging off the side. The lift covered 4 kilometers of terrain and you could get off at the midway point! I was worried I was getting into much more than I could handle on this two-day ski adventure when I hadn’t skied for seven years. As I went about trying to ski, I realized I didn’t really know how to ski anymore and couldn’t turn in any fashion other than in a wedge. I survived day one (which included a trip to church to celebrate Easter the night before the holiday and is a whole different story), but day two started out earlier and lasted many more hours. I was sore. I couldn’t really ski. Heidi kept taking me down black hills that scared the living daylights out of me. We skied so far away that we caught the ski bus to take us back to the Leogang side of the slopes. 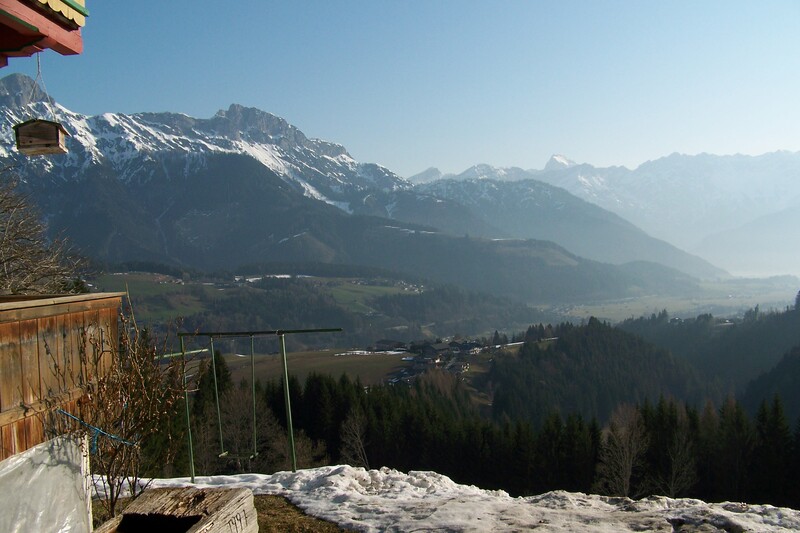 We could see the Großglocker, the highest point in Austria. I was thirsty in a country that doesn’t have drinking fountains and isn’t happy giving out tap water for free. Her brother was kind-heartedly picking on my love of wedging, since that was the only way I could get down the hill. I was also quite hot because I was overdressed for skiing in 70+ degree April weather. Finally, I more or less said that we needed to start heading back because I was too exhausted. But it required a lot of skiing to get back to where we started and we had to beat the lifts that were approaching closing time to get there. And then I recognized the area where we started. Heidi’s mom was waiting at the top of the gondola, which I rode down with her rather than ski all the way to the bottom. And so, my last memory of skiing was this not so happy ending to a wonderful Austrian ski adventure. Now I’ve planned this trip to Utah to see my boyfriend that will likely include two days of skiing, and all I can think about is how nervous I was skiing in Austria and how I couldn’t turn. I’m not much for doing things that I don’t want to do. I would easily not eat dinner to avoid some scary-looking food. I started this Austria ski trip in a good mind set and was pretty pumped about skiing in the Alps. I left worn out and stressed, not being able to end on a good run. It also left me with no real burning desire to strap skis to my feet again, either. But I want to participate in Jon’s life, and Jon’s life involves skiing. And I have to ski because his ski area of choice bans snowboarders. So my dad and I headed to Holiday Valley over New Year’s weekend so that I could relearn how to turn and uplift my confidence. I can turn, so I at least have that going for me. I’m still a basket case about everything else. Usually the more I prepare for something the more confident I become. Sharing my thoughts and feelings usually helps, too. This hasn’t been the case. I’ve made Jon nervous about taking me skiing, and he doesn’t get nervous about skiing, because I’ve worried about it so much. I looked at the map of Alta online and was impressed by its graphics. The chart says that 25 percent of the hills are beginner and 40 percent are intermediate. That sounds like a good amount of potentially Alison-friendly terrain, until I looked at the map and saw that black diamonds cover most of the terrain, regardless of what the percentages say. And the base elevation at Alta is higher than the majority of the Alps, even if the vertical drop of Alta is only half the distance of Skicircus. And then on Sunday, when I bought a Salt Lake City guidebook, I decided the first thing I would read would be the description of Alta, which says Alta has some of the most difficult terrain in the world. And if you would fall on one of a couple black hills, you likely wouldn’t stop rolling. Ever. Fortunately, I don’t have to worry about that because I won’t be going down any black hills. Black hills in New York are scary and all ratings are relative, so these ones can only be worse. What all this comes down to is that I’m worried. I want Jon to still have a good time skiing and I don’t want to disappoint him by hating his favorite ski resort, just because I’m afraid and not having fun. So what do I do? I keep looking at my map of Skicircus, telling myself that I managed to survive this massive ski area with 90 trails. I did it. I fell only once on nearly level ground and I didn’t break anything. And that was when I couldn’t turn. I can turn now, and that’s all that matters. I can’t have any fun if I don’t try, and I’m not flying all the way to Utah to watch my boyfriend and his friends have fun skiing while I sit in a lodge and read a book (not that that wouldn’t be fun). Maybe that will be what I do at some point in my life, but not this time. This time I have to try. This entry was posted in Europe, North America, Planning a trip, Travel Narrative, U.S. and tagged Alta, Austria, Confidence, Czech Republic, Fears, Germany, Hochficht, Leaving my comfort zone, Mountains, New York, Ohio, Photos, Skicircus, Skiing, Snow, Snowboarding, Travel, Utah, Worries. Bookmark the permalink. You’ll be fine! Good luck and have fun! !